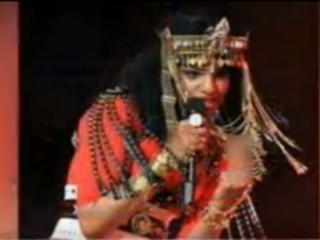 Did you catch it when British singer M.I.A. flipped the bird to 110 million Super Bowl halftime viewers last night during Madonna's performance of the new single, "Give Me All Your Luvin' "? We're guessing she's not the least bit sorry about all the attention she's received as a result. But the NBC and the NFL have issued apologies, calling the gesture "inappropriate" and blaming the delay system for failing to catch it before it hit fans' television screens. The NFL said, "There was a failure in NBC's delay system. The obscene gesture in the performance was completely inappropriate, very disappointing, and we apologize to our fans." An NBC spokesman explained, "The NFL hired the talent and produced the halftime show. Our system was late to obscure the inappropriate gesture and we apologize to our viewers."